During the period of three years, between 2004 and 2006, first-person shooters lived through a renaissance. In 2004 we got Far Cry, HL2, Halo 2, and Doom, moving graphics to the next level while introducing unique storytelling and tremendous advancements when it comes to the size of individual levels. It also introduced auto-regenerating health, which soon became the standard in the genre. 2005 had a massive number of quality titles including Battlefield 2 and Star Wars Battlefront II, two games that pushed multiplayer shooters to new levels with map sizes and the number of players that were running through maps at the same time. It also had Call of Duty 2, showing the world how a perfect single player campaign should look like. In 2006 we got Gears of War, a game-changing title that, although it wasn’t an FPS, but a third-person shooter, introduced cover mechanics that will be used in a ton of FPS games in the future. Finally, 2005 gave us a gem of a title called FEAR, a game that didn’t leave a mark as big as the other titles we mentioned, but one that was ahead of its time when it comes to certain gameplay elements and one that should be studied by today’s game developers. FEAR is one of the best FPS games ever. The game is a mix between a first-person shooter and terrific horror experience. While horror elements are there in bunches, the game is strongly set in FPS genre. You play as a newbie, recently recruited to F.E.A.R (First Encounter Assault Recon) team specialized in dealing with unknown, and soon after the game starts you realize that something’s very wrong. FEAR features the best gunplay mechanics I saw in any game, and I played tons of FPS games. It also features some of the smartest enemies ever to appear in a first-person shooter title, even though the game came out near the end of 2005 when single core CPUs were the standard. It is so sad to see modern games that throw all money in graphics and presentation while enemies you encounter behave like they are profoundly mentally challenged, while we all have behemoths of PCs with CPU power tens of times more powerful than CPUs FEAR developers made the game for. They made the best AI ever, and it used just one core! For instance, Crytek claimed that the first Crysis used one CPU core just for its AI, and the AI was slightly above average. Just imagine how smart enemies we could face if developers decided to relocate ten percent of their budget into making a proper AI algorithms. Oh well, let’s just forget how AI in games is on a halt for more than a decade and talk why FEAR is so good, why it is still one of the best shooters ever, if you can chew through dated graphics. Let us see what modern FPS games can learn (and hopefully implement) from FEAR, and why the game is this good. The best part of FEAR was its shooting elements, and that should be true for all first-person shooters. Weapon mechanics were so believable, so visceral. They packed an incredible punch, every bullet had clear weight, and when you hit an opponent, you could feel how lead cut through their flesh. Every weapon behaves uniquely, from SMG and its pray and spray, ultra-fast fire rate, to the lovely feel of the Penetrator, a weapon that shoots metal bolts that pack so much punch it is incredible. Penetrator’s ammo is capable of literally knocking down enemies to walls, which is so rewarding, especially when you manage to hit assassins, which are extremely fast and hard to pin down. The assault rifle along with its upgraded version that fires more quickly and packs a scope are the two main weapons used throughout the majority of the game, and they both have an ultra-realistic feel to them. When you shoot from the assault rifle you feel its immense weight, you feel how bullets explode in the barrel and how they accelerate before leaving it and hitting some poor dude who’s on the other side of the room. And bullets hit, and they hit hard, so hard it can become a bit of unpleasant during massive gunfights. On top of that, we have one of the best grenade effects ever to be featured in an FPS game. When a grenade explodes, it sends waves of impact force that destroy everything they hit, whether that is a part of a wall or an enemy soldier. If you’re in the vicinity, you can literally feel the impact, making grenades very fun to use. And best of them all is the shotgun that packs so much punch is just unnatural. It destroys concrete and turns enemies into a bunch of red gush if you hit them from near vicinity, or just sends them flying with body parts all over the place when hit from a couple of meters. Add to that a superb bullet time mechanics were you can see bullets fizz around you, like they travel through a liquid much thicker than water, and how they hit enemies along with animations that show how they react to hits, and you got yourself a game where you impatiently wait for the next gunfight. Another standout is an excellent sound design where every piece of weapon has unique sounds. They sound like you really fire hot lead towards enemies, and they sound powerful, with lots of impact with every shot fired, and with lots of basses once you activate bullet time mode. Also, enemies react to hits, they start to panic and shout in pain, making fights even more realistic and intense. The final piece of spectacular gunplay mechanics in FEAR is the way how the environment reacts to bullet hits. Walls are shattered, dust is all around, pieces of furniture explode, glass shatters, particles fly all over the place, and it all looks out of this world. So intense, so frantic, so pumped up, and oh so good. If you like quality shooting with extremely exciting fights, check out FEAR. But, a good gunfight is nothing if enemies are dumb, but in FEAR they are smart as they can get. In FEAR, your main enemies are genetically engineered soldiers led by a commander with psychic powers who’s able to lead them from a distance, and developers made soldiers so smart you really think they are led by an ultra-smart psychic. Another cool thing is that different enemies behave each in their own way. Security forces found in early parts of the game are less likely to use advanced tactics of covering fire and flanking. They communicate to a lesser extent than genetically engineered commandos and aren’t as synced as them. They are easier to outflank and hit and are a superb way to introduce players to FEAR’s advanced enemy AI. And then you start encountering commandos, who are extremely smart. They employ different tactics to drive you out in the open or to outflank you. Covering fire in combination with one, or a couple of them, flanking your sides and start shooting at you when you least expect. Or trying to drive you out in the open by (very precisely) throwing grenades at you. You can hear them communicate, talking about player’s position and telling others how they plan to take on the player. And that’s amazing to experience because in most modern games all AI enemies can do is to take cover (sometimes on the wrong side), shoot at you and slowly advance to your positions. FEAR commandos are like super geniuses compared to most enemies you encounter in modern games. Assassins, on the other hand, play hit-and-run tactics. They would circle the player for a couple of seconds, become visible a couple of times (they can cloak) so they trick you before launching an attack. This is bloody amazing and makes them very hard to kill. Heavy armor units are also different in their behavior. They tend to slowly advance on you while spraying you with a Heavy Penetrator’s metal stakes. Since they are extremely hard to kill, the player must always be in cover, trying to kill heavies with grenades or Penetrator, sometimes trying to get out of cover and fill them with lead from your shotgun before retreating, and sometimes just using the rocket launcher to turn them into red goo. In general, FEAR showed how enemy AI can be smart, how it can improvise, how it can utilize different tactics depending on the number of enemies and the layout of the surrounding space. It showed how you can make the best AI ever, which can work on single-core processors, and it is really a shame no one topped FEAR’s soldiers even though more than a decade passed since this amazing game came out. Last, but not least, FEAR built an atmosphere that made players to play with lights on and start fearing the dark. While you play FEAR the intensity and tension are so thick you can cut them with a knife. You always roam through dark spaces with lots of ambient sounds and excellent lighting effects. And your main enemy, a small girl with immense psychic powers tends to appear in places you least expect her. She doesn’t hurt you (most of the times), but these encounters are so marvelously done it is really worthy of praise and absolute respect for developers. When you roam through loosely lit offices and see wet, small feet marks start appearing in front of you, while you start experiencing both audio and visual hallucinations, you know what fear of the unknown is. And the fantastic sound effects always keep you on the edge of your seat, always wondering what that noise is and what horror will welcome you in the next room. FEAR is a better horror title than ninety-five percent of horror titles because it managed to produce an unmatched psychological horror atmosphere where you fear of the unknown and not of monsters that always jump out of closets. Also, we already talked about the gunfight atmosphere with shattering walls, lots of particles and excellent sounds. In general, FEAR possesses atmosphere that is very hard to explain, but once you experience it, you will completely understand what I’m talking about. 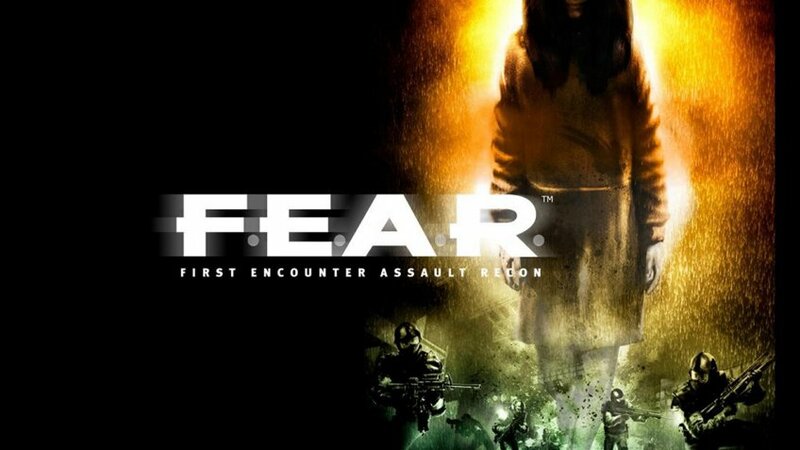 FEAR should be played by members of every game studio that plans to make a first-person shooter. Because we already have dozens of titles that possess excellent graphics and not much else. If you really want to make a spectacular shooter, try making a similar gunplay mechanics to FEAR, and don’t be shy of investing resources into making an AI that actually can be feared of. For all of you who didn’t play FEAR, you should get it and play it right now. Along with two expansion packs, the game offers more than twenty hours of chilling action that puts most other shooters to shame, and it can be found for ten bucks on GOG, but not on Steam. If you played FEAR well, you know what we talk about and you probably think about making another playthrough. Got ahead and do it, the game certainly deserves it.